2017 was a year when all three industry groups delivered growth. 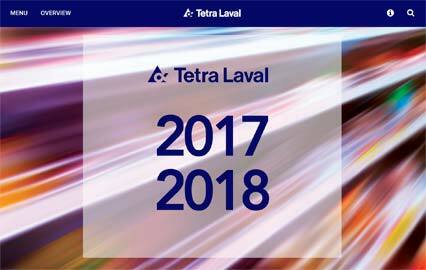 Tetra Laval Group’s net sales amounted to €13.9 billion, a nominal increase of about 1 per cent compared to 2016. At comparable rates, sales increased by 1.7 per cent. The reason for the increased sales was that both capital equipment sales and service sales grew for all industry groups. Driving factors were increased demand and an attractive customer offering. However, the strengthening of the euro versus the USD negatively impacted sales. Operating profit improved in absolute terms and remained unchanged in relative terms. The main contributor was sales growth, as well as the on-going transformation programmes in all industry groups that made significant contributions. I want to express my gratitude to our dedicated personnel for their outstanding achievements during the year. Total sales of Tetra Pak grew 0.5 per cent in a challenging market. Growth of capital equipment sales in both Packaging and Processing contributed with 14 per cent and 3 per cent respectively. Service sales success of recent years continued with a growth rate of about 6 per cent. Profitability grew in line with sales. Packaging material sales declined slightly due to competitive pressure and macro-economic instability, particularly in the Greater Middle East. The number of packages sold globally amounted to 188 billion in 2017.